Thrilled by the sounds of engines flying overhead? This program will teach you to service, repair and overhaul both reciprocating and turbine engines in our classrooms at Republic Airport. You’ll find out how these giant engines are also used in powerplants throughout the country as you work toward an FAA Powerplant license–the ticket you need to get a job! Upon successful completion of the Aircraft Maintenance Technology Program and enrollment in a college or university, students can be granted up to 64 credits because of Federal License Regulations. 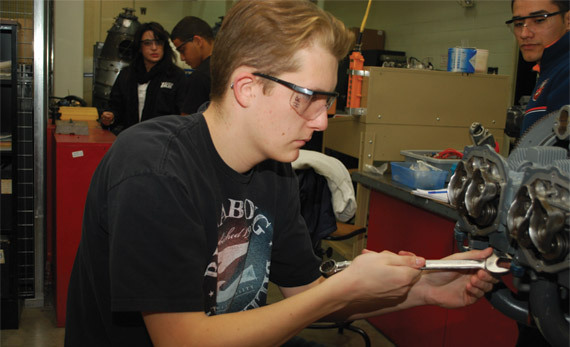 Wilson Tech has Articulation Agreements offering advanced standing with many post-secondary institutions that offer degrees in Aviation Technology and Aeronautical Science. 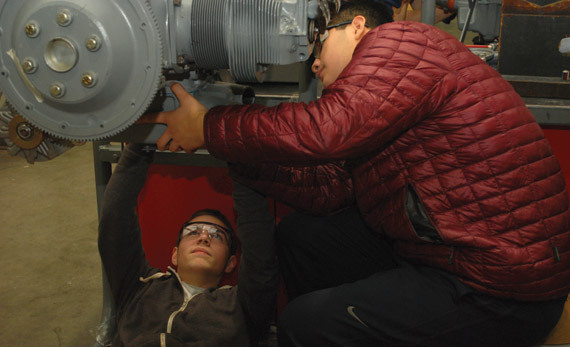 Many students continue their studies at Western Suffolk BOCES’ School of Aviation Maintenance Technology at Wilson Tech’s Republic Airport campus to prepare for Federal Aviation Administration (FAA) licenses in Powerplant and Airframe. Students will practice skills in airframe structures and powerplant overhaul, working under very rigid procedures and the close supervision of inspectors. Students will observe strict federal safety rules and regulations. *Note: In order to meet FAA licensure requirements, students must attend a seven-week summer session and have no more than 10 absences per academic year. Juniors who can make transportation arrangements and have parental permission may attend immediately after their junior year. The summer session is at no additional cost to districts. Students must successfully meet the academic and attendance criteria for a two-year Wilson Tech Certificate of Completion, be High School diploma eligible, and pass the following national certification exam: Federal Aviation Administration (FAA) General Qualification Exam. Diana Santiago started her career at Aviation High School in Queens where she obtained her FAA Airframe and Powerplant licenses. Aside from her FAA Licenses, she holds an EPA license in universal refrigerant recovery as well as her bachelor’s degree in aviation transportation and master’s degree in business administration from Dowling College. After working in fleet management at the Department of Energy – Brookhaven National Laboratories, she worked as an aircraft mechanic at SUNY Aerospace and obtained experience as the manager of aviation partnerships at Vaughn College of Aeronautics, where she also served as an adjunct professor.